I am not generally a fan of Wilkinson's late 20th century presentation or commemorative swords, but that one looks very nice. Thank you for sharing! Thank you, Mervyn! I am glad the review was of help. I have known Richard through online fora since 2006 and I have had the pleasure of meeting him in person. He is the sort of person who is a font of knowledge, and after speaking with him one thinks, "He should write a book!" And now he has! I have added links in the book reviews section. Thank you! Here are links to my REVIEW of The British Cavalry Sword 1788-1912: Some New Perspectives and my INTERVIEW with the author. I agree on all points, Brian. I will post this in the lost/stolen section, too (I just noticed it ). 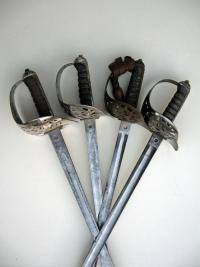 It looks like some Dutch and Danish hilts c.1800. I do not think it has Indian origins. Not my area at all, but it looks like a Continental sword from c.1800 give or take. 1796 BRITISH LT. CAVALRY SWORD. I don't recall if the alleged complaint is covered here, but for further reading on the 1796 patterns I highly recommend the articles by Richard Dellar which are online here: http://www.swordsand...ageNum=1&aID=10 It is possible that you sword (and mine) were actually assembled in England with English-made hilts and German blades. You may have since identified this sword, but just in case you have not, it is a battered Italian M1871 cavalry trooper's sword. Nice dirk, Mervyn! I hope you can ID the midshipman and share a bit of his story with us.